When Erin at Earrings Everyday posted that June's "We're All Ears" Inspiration was Fireflies, I knew I wanted to play along. 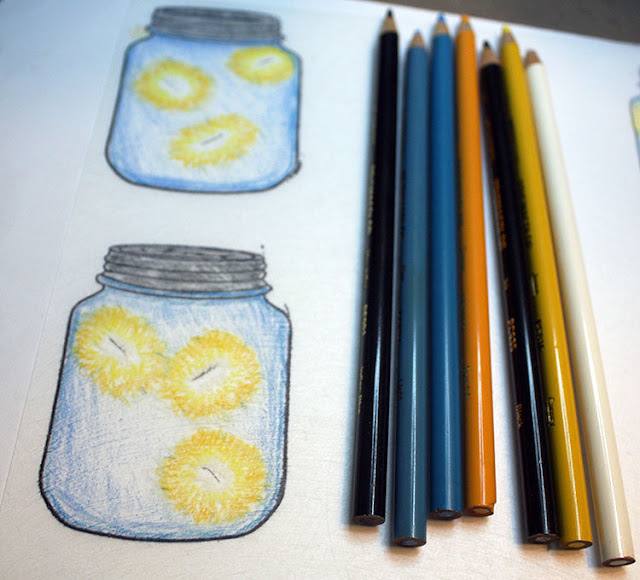 I immediately recalled childhood summer evenings in an open field, my family, and a couple of jars. I knew what I wanted to make. I took the inspiration almost literally. And, I even considered adding little LED lights. However, I just didn't have enough time to search out and get the lights. Instead I worked with materials I actually had on hand. I have to admit that I'm a kid when it comes to lightening bugs. When we moved into our house almost two years ago, I was such a big kid on the porch squealing with delight over the fireflies. As such, this project is a bit kid-like; perfect for crafters of all ages! 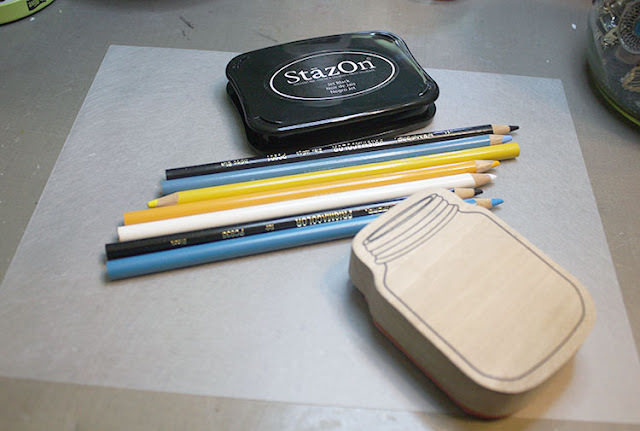 Start with Staz-on ink, a rubber stamp, colored pencils, and your shrink plastic. 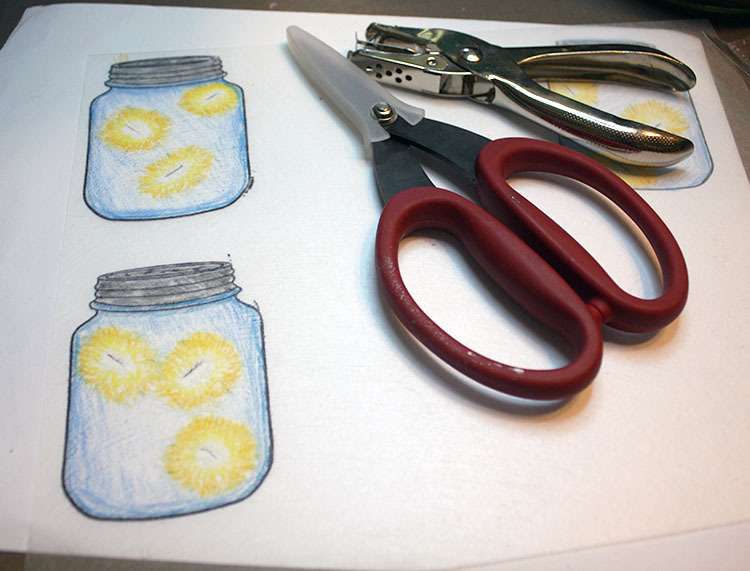 For this project, I'm using Prismacolor pencils as they work beautifully on shrink plastic. Also, please note that the plastic is Shrinky Dink's Frosted Rough-n-Ready. This type has a 'rough', sanded side that makes it easy to color with the pencils. On the frosted (not shiny) side, stamp your image using the Staz-on ink. 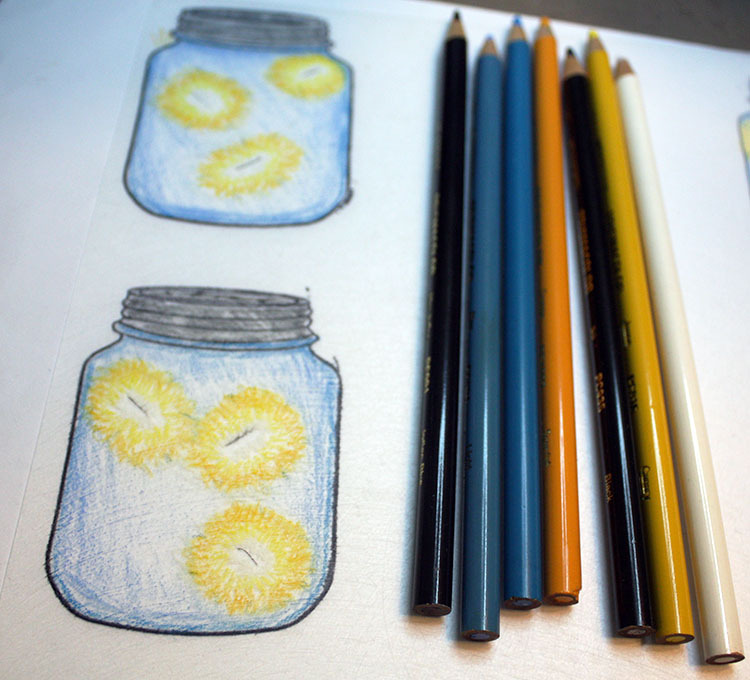 Draw/color your image with the colored pencils. Grab a pair of scissors and a hole punch. Cut around the image. I cut slightly out from the stamped lines, but you can cut closer if you wish. Punch out a hole at the top of the image. I would have made a tab for the hole at the top, but stamped too close to the edge initially (oops!) 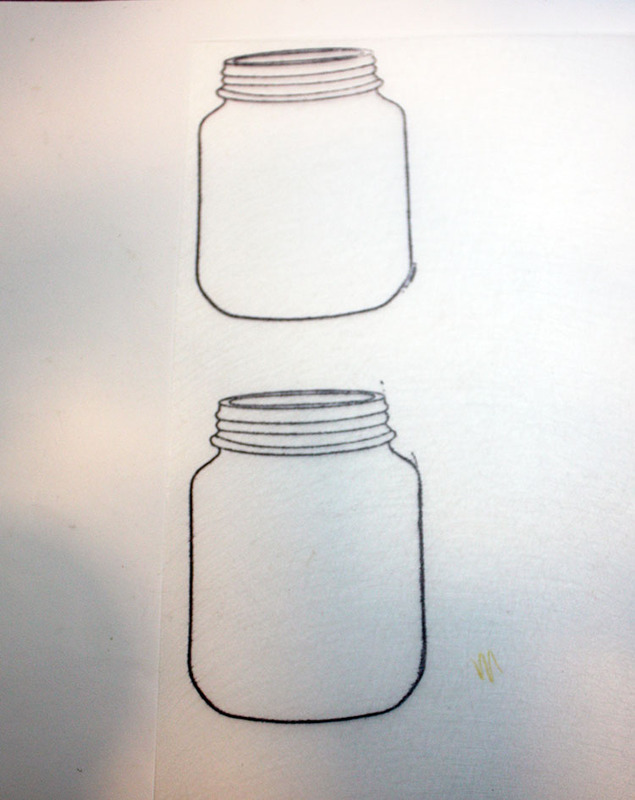 Instead, I punched the hole inside the lid of the jar. Prepare to shrink. Shrink Plastic can be shrunk in an oven/toaster oven or with a heat gun. For small projects like this, the heat tool works just fine. I like to work on a piece of tile and use a metal knitting needle to hold the plastic in place so it doesn't blow all over my desk. 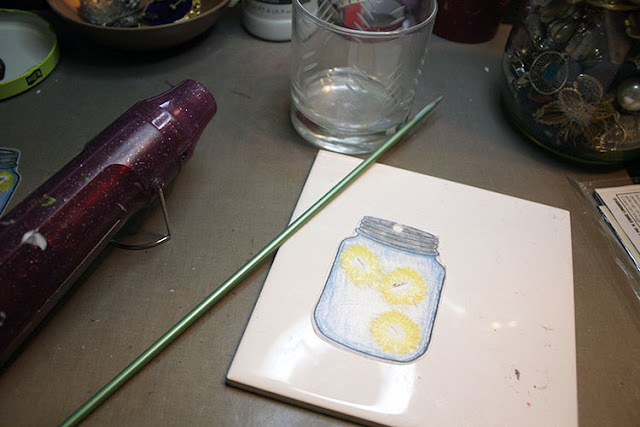 As well, keep a flat-bottomed glass on hand to press on the plastic as soon as it's done shrinking. This helps make sure it's good and flat, not wonky. Once the plastic is shrunk down, it is much thicker. This is why you want to make sure you cut and punch the holes before you shrink it. It's impossible once shrunk. Just as it started, the Rough n Ready plastic ends up with a matte side and a shiny side. I like the shiny side for this project as it makes the jars actually look like glass. 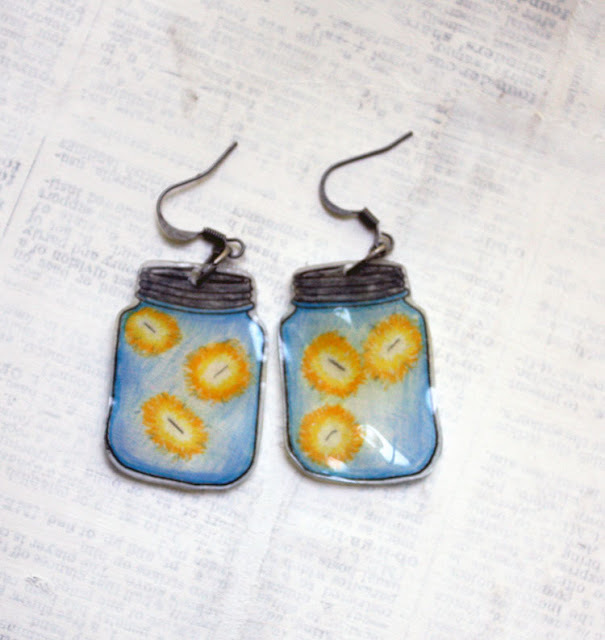 Add jump rings and ear wires to the holes to turn your shrunk images into earrings. And that's it: trapped fireflies for your ear lobes. Of course, you don't have to make jarred lightening bugs. The Shrink Plastic is so versatile. 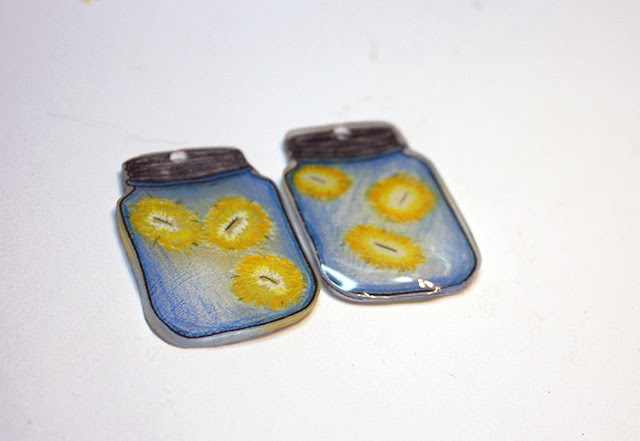 You can use any stamp or even draw your own image to make charms with the plastic. Make sure to check out the Lightening Bugs Reveal at Earrings Everyday to see how the other participants interpreted the inspiration. 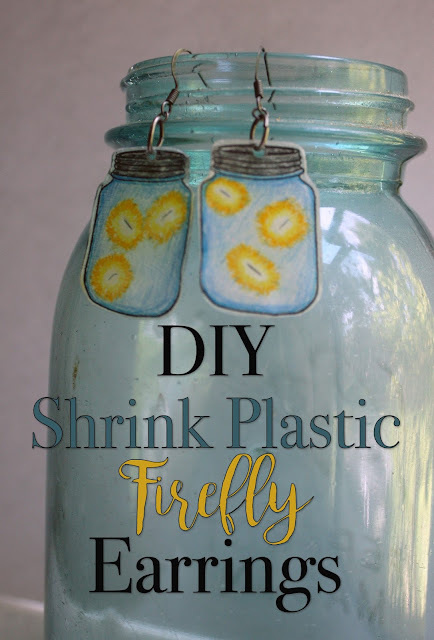 Have you ever worked with Shrink Plastic? It really is so fun, easy, and versatile! I've linked this diy on Show and Share at Coastal Charm, the Saturday Sparks Link Party at Pieced Pastimes, Saturday Sharefest at The SITS Girls, Dare to Share at Pam's Party and Practical Tips, and the DIY Craft Link up at Pleasures of the Northwest. These are awesome! I love fireflies too, and I hear that there are lots of them in North Carolina. I'm hoping that we get to see a bunch of them while we camp! Thank you! Is that where y'all are headed? Somehow I don't think I remembered that. I hope you get some pictures if you do indeed dee bunches of fireflies. Of course, Pat suggested I make Serenity instead of the bug. Ha! Thanks so much Ann! I'm pleased you think so. Thank you for hopping by! 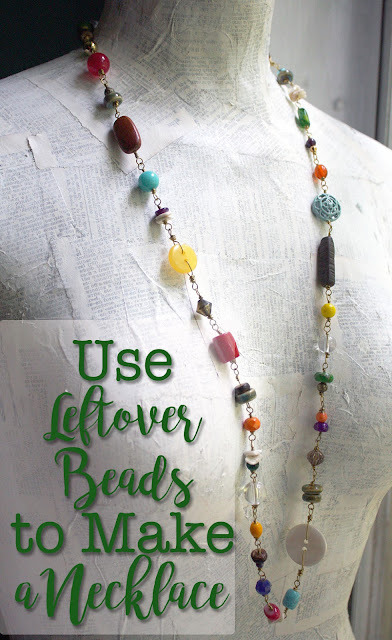 What a wonderful idea and a great tutorial. Thanks for sharing. Thanks Kathy! They were fun to make. Sometimes it's nice to make something simple and kid-like! Who knew?? What a fun craft item, I've never heard of shrink plastic, the jars are adorable! Aw, thank you!! 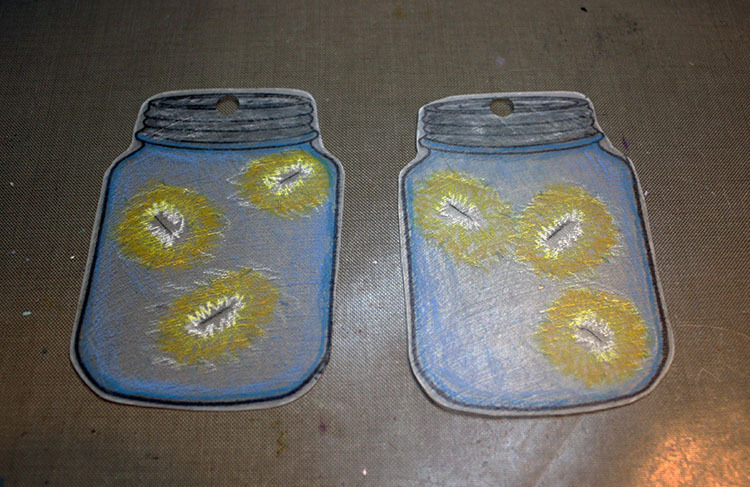 As soon as I saw the inspiration, I saw the jars in my head. I had to recreate them somehow. I think this worked out well. I'm glad you like them too. YAY!! 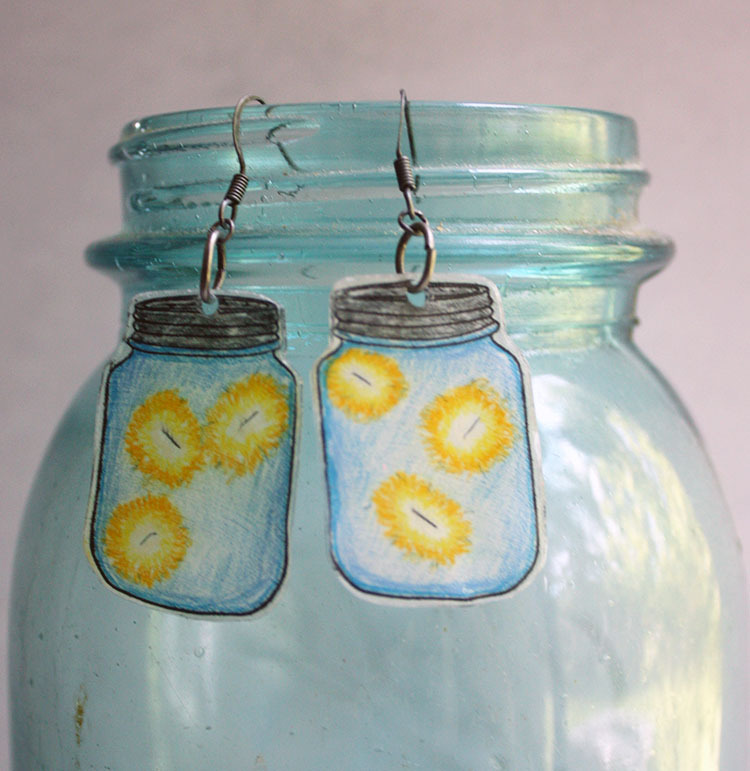 what a great project and a fun pair of earrings!! Thanks for sharing on the Pleasures of the NW's DIY link up!